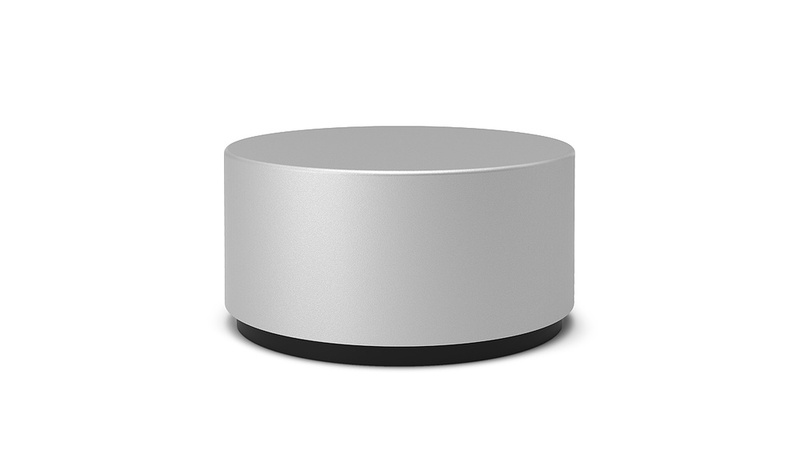 The Surface Dial in all its minimalist glory. When Microsoft announced the all-in-one Surface Studio last October, the company also unveiled a new input device called the Surface Dial. The Dial is designed to work with the Studio, either sitting on the desk or being placed directly on the screen. In this latter case, with compatible software, controls will appear around the device’s location, enabling you to manipulate certain parameters whilst still using the Pen. Microsoft have said that a firmware update will be made available for Surface Pro 4 and Surface Book devices at some point early this year to provide the same functionality, albeit on screens significantly smaller than the Surface Studio’s mighty 28-inch display. The Surface Dial’s usefulness isn’t restricted to compatible Surfaces, however, since it can be used with any Windows 10 PC supporting Bluetooth Low Energy. The only caveat is that non-Surface devices won’t respond to the Dial being placed on the screen, regardless of whether they support touch or pen input. But even lacking this ability, the Dial still provides some interesting functionality. If your computer doesn’t have Bluetooth 4.0, you’ll need a Bluetooth USB adapter — I purchased one made by Pluggable, which seems to work well enough. Next, you pair the Dial with your computer. When you first unpack the Surface Dial, it has a little plastic strip that needs to be pulled away to activate the supplied pair of AAA batteries. These are stored in the bottom of the Dial, and a nice touch is the magnetic panel that reveals the battery compartment and a button that begins the pairing process. 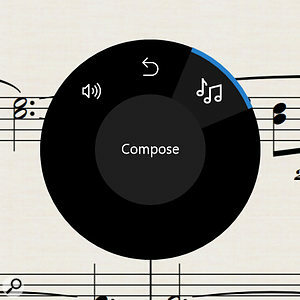 Here’s the Radial Menu displayed in StaffPad. 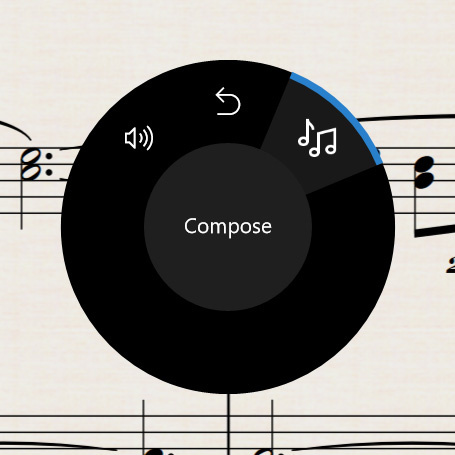 Note that, in addition to the default behaviours, StaffPad has added an app-specific ‘Composer’ item.The Dial itself is silver, metallic and very unassuming. It has a comfortable 59mm diameter and a height of 30mm, with an additional 4mm for the base that has a tacky rubber finish to prevent the Dial from sliding around. When you press and hold the device, a radial menu will appear in the centre of your primary display to select the behaviour of the Dial for the current application. Simply turn the Dial to select a given item and press again to confirm. Windows offers some generic functionality for scrolling and zooming, as well as setting the overall system volume and performing undo/redo commands. There’s also a potentially useful ‘Next Track’ behaviour where, if you have a music player application like Spotify open, you can turn the Dial to select the next or previous track, and press it to play or pause the current track. The Dial can provide haptic feedback depending on its function. For example, when you press and hold the Dial to bring up the radial menu, it pulses once to register the request; and, when you turn the Dial, haptic feedback can be used to simulate a stepped rotary encoder. While behaviours like Scroll and Zoom have no need to support this, it’s useful if the Dial is being used to select discrete steps like the next/previous track or undo/redo commands. And if the Dial is adopted by music and audio software, this feedback would provide greater accuracy when adjusting parameters. The only music creation app to support the dial right now is StaffPad, which has arguably become one of Microsoft’s posterchild apps for Surface. StaffPad supports the Dial being placed directly on the screen, to access tools and symbols (such as trills and tremolo), and also on the desk, where the Radial Menu offers a Composer item. With this selected, pressing the Dial toggles playback, and turning it moves the cursor forwards or backwards at a full-bar resolution — haptic feedback is helpfully used to indicate each bar you step over. The Surface Dial is a neat accessory and its usefulness will hopefully grow as more developers offer support. And because the Dial can be used with traditional Windows applications, as well as the modern Windows Store apps, there’s no reason companies such as Steinberg, Ableton and Cockos couldn’t add support in programs like Cubase, Live and Reaper. UK pricing and release date TBA.